Max weight is 90 KG. Get out there and experience New Zealand?s spectacular bucolic landscapes on a fully guided horseback ride through a private farm and forest before enjoying afternoon tea in a local Colonial-era pub. A one-hour bus ride lands you on a private farm in the middle of Auckland?s scenic countryside. Here you?ll meet an experienced rider guide who will provide a safety briefing and all the necessary gear. Then climb on your well-mannered steed and head out on a leisurely jaunt along a trail that passes through forest, pasture and marshland. You might even encounter goats and other farm animals along the way. After your ride, travel a short distance to the Puhoi Pub Hotel & Stables, a historic watering hole open since 1879. Savor a cup of tea, coffee and muffins in a pub strewn with antique artifacts and photos from yesteryear ? or take your refreshments outside on the front porch for a panoramic view of New Zealand?s picturesque rural terrain. 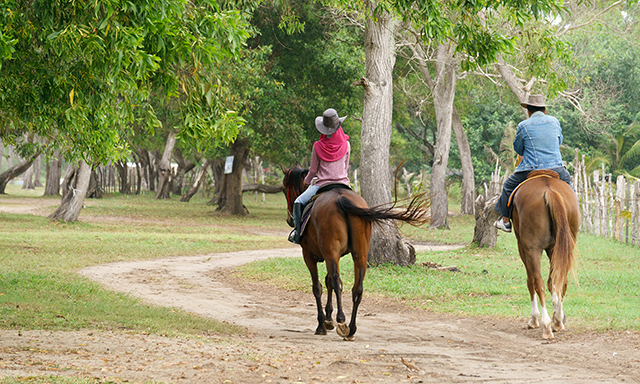 • Horse trekking: Riders of all levels can join an expert guide for a one-hour trip on horseback on well-mannered horses. • Auckland: Traipse a trail through rural New Zealand wilderness that leads you past marshland, farmland and green pastures. • Puhoi Pub: Tea, coffee and muffins will be served at a historic bistro that dates back to the late 1800s. • Guests must be able to walk over various surfaces, with inclines and steps and extended periods of standing. • Pregnant women and guests with back/neck problems should not select this tour. Guests in wheelchairs and others with limited mobility should not select this tour. • Guests with pre-existing neck, back, knee and/or shoulder injuries, cardiac conditions, asthma, diabetes, epilepsy, other heart or respiratory conditions or any other medical condition must take particular caution when selecting a tour ? particularly tours categorized as "strenuous". • Guests who have concerns must consult with their personal physician before engaging in any activity that may be strenuous for them. • Participation limited but minimum required for tour to operate. • Guests should not carry or wear valuable items for this active excursion. • The drive between port and farm is approximately 1 hour each way. • Tour sequence may vary.